BJP’s strong rebuttal came after Congress MP Sushmita Singh on Thursday said that his party will revoke the Triple Talaq Bill if it comes back to power at the Centre. New Delhi: The BJP on Thursday slammed the Congress and its chief Rahul Gandhi for promising to revoke the Triple Talaq bill which aims at criminalising the practice of instant divorce among the Muslim men. “Rahul Gandhi said that it they come to power they will ban the Triple Talaq Bill, this is height of appeasement,” said BJP spokesperson Sambit Patra. “Main aap logon se vaada karti hoon, ki Congress ki sarkar ayegi 2019 mein aur hum iss Triple Talaq kanoon ko khaarij karenge. Yeh aap logon se vaada hai (I promise you that the Congress will revoke the Triple Talaq law when it comes to power in 2019. This is our ptomise to you),” Singh said while speaking at the national convention of the AICC minority department in Delhi. Congress chief Rahul Gandhi was also present at the event. The Triple Talaq Bill remains stuck in the Rajya Sabha in face of a combined opposition insisting that it be scrutinised by a select committee of the House. The Muslim Women (Protection of Rights on Marriage) Bill, 2018, which was passed by Lok Sabha on December 27 last year, couldn’t pass through the opposition muster in the Upper House. Patra further slammed Rahul for using inappropriate words against Prime Minister Narendra Modi, saying that it shows the Congress president’s “mentality and nervousness”. 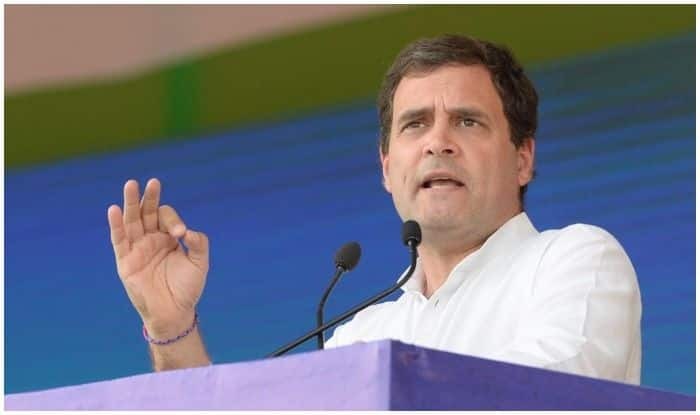 Speaking at event, Rahul launched a scathing attack on Prime Minister Narendra Modi, calling him a “coward” and challenging him to a 10-minute debate on issues such as national security, Rafale and the economy. “I know his (Modi) character after fighting him for five years. He is a coward. When someone stands up to him, he runs away,” he said. The Congress chief said fear was writ large on PM Modi’s face.